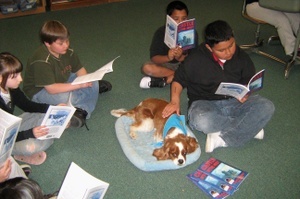 Reading to dogs, by third graders in the Longfellow Elementary School in Sheboygan, Wisconsin, is having a definite positive impact on their skills and enthusiasm for reading. Julie Hauck, the teacher who developed this innovative program, is measuring the results and is producing a study, backed by statistical analysis, that substantiates the positive impact of the program. Planet Of The Dogs and Castle In The Mist have been chosen as core books for the program -- Pages For Preston. Preston -- a Cavalier King Charles Spaniel -- is the dog in these photos taken in the classroom. 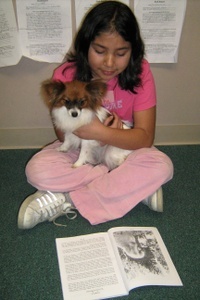 Jezebel, the second dog currently in the program, is a Papillon. "The kids and the dogs can teach adults a lesson." "The dogs use Daisy and Bean because kids have more love than adults." "I like that there is different places for different kinds of dogs, like Waggy Valley and Muttville." "This book is good because it teaches about problem solving." "The book is good because it teaches about friendship." "The dogs can understand the kids and the kids can understand the dogs." In April, Julie Hauck made a presentation of the Pages For Preston program at the Wisconsin Interlakes Reading Council. The presentation included a DVD of the children reading to the dogs, an appearance by Preston, and a copy of the Barking Planet books for all the attendees (43). The Council -- comprised of librarians, teachers, school psychologists, principals and other educational professionals -- gave the presentation a very warm reception.